If you're like me and don't care for the new Touch Bar variety of MacBook Pros, you were probably unnerved by the fact that Apple no longer has the 13-inch Retina MacBook Pro available on their site. A screenshot taken of https://www.apple.com/shop/buy-mac/macbook-pro/13-inch on December 26, 2017. The Retina MacBook Pro is not listed. Does this mean they're doing away with the rMBPs altogether? I currently have a 13-inch rMBP (Early-2015) that I bought "maxed out" when Apple introduced the new Touch Bar MBP. I bought it thinking Apple would immediately discontinue the previous model and I wanted one that was "future proofed" in hopes of staving off the inevitable need of buying one of the new models. I was happy to see Apple kept the Retinas around, but now that the 13-inch model is gone, it might be only a matter of time before the 15-inch model is EOL'd too. Have you ever looked at someones screen and see files and folders scattered all around their desktop? That stuff makes my skin crawl. I'm super OCD about the setup and organization of my computer. Probably because I like things organized and structured in general, but more so because I work (and live, to some degree) on my laptop. It's my primary tool. It's my virtual office. I need it to be organized and efficient. I need to be able to find what I'm looking for when I need it. I need it to be predictable and intuitive, like a great sidekick. So over the decade of almost exclusive Mac-use I've become very opinionated about how a new Mac should be setup. These opinions are suited to my needs, wants and biases, but based on what I've seen on other people's computers, I think some of you could benefit from a few of my basic guidelines. So here it is. For all of you who just got new computers (Mac or otherwise), I'm going to document, in as much detail as possible, on how I go about setting up a new computer right out of the box. That's a fair question. After years working at the Genius Bar I'm of the opinion that too many things can go wrong when migrating data from an old computer to a new one - even if they're running the same version OS. Preferences can get corrupt. Programs can not function properly on the new machine. Even though it's easy, it's just not worth it to me. On top of that, I just prefer to start "clean" with a new computer and bring over only what I know I need. I tend to own a computer for at least a couple of years. In that time my peripherals and software needs change. By constantly migrating from computer to computer I'm bringing over drivers and software from that Epson Inkjet printer that I threw out in 2010. No thanks. I like to keep my software as minimal as possible. Ok, now back to business. It's a necessary evil, but you've gotta do it. Having "everything" in my Dock is too cluttered. I prefer to take everything out of my Dock. The advantage? I can always tell what Apps I have open because they're in my Dock. 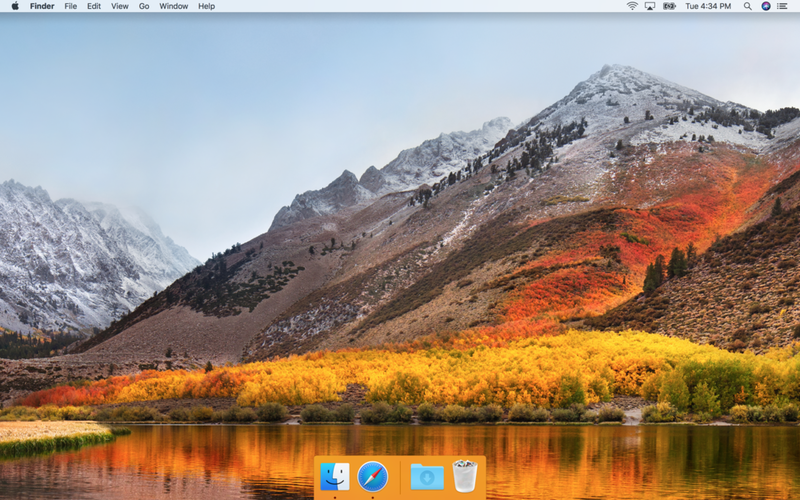 When you remove everything from your Dock, you can always see exactly what Apps are open. In fact, I rarely launch Applications from my dock, so I tend to keep it hidden. Maximize your screen real estate. And speaking of screen real estate, I tend to use the highest resolution possible, at least while my eyes are still good. A couple of things with the keyboard. First, make sure you allow "Full Keyboard Access". This allows you to tab all over the display. Secondly, there are a number of custom keyboard shortcuts that I use. It's a feature that not many people use in MacOS, but as long as it's an option/control/setting that appears in an app's menu bar, you can map it to a keyboard command. 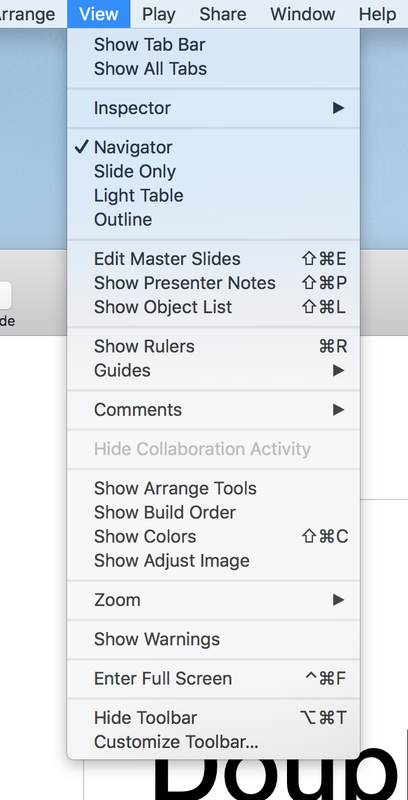 For example, I like to quickly toggle between Navigator and Light Table view when I'm making a Keynote presentation. But there isn't a keyboard shortcut for that out of the box. However, I can add my own keyboard shortcuts using the Shortcuts option in Keyboard preferences. There are a couple of other customizations I like to do that aren't available in System Preferences. By default, Mac OS will place screenshots (⌘- Shift - 4) onto your desktop. This can get unruly very quickly. To keep them organized and handy, I configure MacOS to store screenshots in ~/Pictures/screenshots by running this command in Terminal. I then place that folder in my Dock and sort them by Date Added to ensure the most recent ones are at the top. This ensures I'll always have quick access to my screenshots. Not all apps are created equal. Some of them definitely require priority boarding in order to expedite the setup. Here are the "First Class" apps that I always install first. I keep all of my passwords and sensitive information in 1Password. This includes keys for applications yet to be installed. Admittedly, with all of the options for cloud storage, including App-specific storing and syncing, I've become a little tepid about Dropbox and it's high price tag. But I've used it for years and it's become a useful archive for all sorts of documents and photos. I also use it to sync data across a few of my apps. Not only is Alfred one of the first things I install, I switch the keybindings to launch it instead of Spotlight when I press ⌘-Spacebar. Spotlight is mapped to ⌥-Spacebar. I can write an entire long form post on why and how I use Alfred, but that is a story for another time. Much like 1Password, TextExpander holds a number of snippets that have become hardwired into muscle memory. I use Xcode to build iOS apps, but it's also required to install Homebrew. It also install git which I use to import all of my projects and finished tools from Github. I spend an astonishing amount of time in Terminal, so I'm particular how I have it setup. Here's a basic workflow of what I do in Terminal when setting up a new Mac. One of the last things I do is install Windows 10 via Bootcamp giving it 120GB of drive space on my SSD. That's it. Not sure what else you expected. I wouldn't really call the an exhaustive description of how I set up a new Mac, but it's certainly not lazy either. I'm such a fan of sites like Uses This and The Sweet Setup. If you've got anything special you do for your computer (Windows, Mac, or Linux). I'd love to hear about it.